Cartoonists put a little of themselves in every character they create. 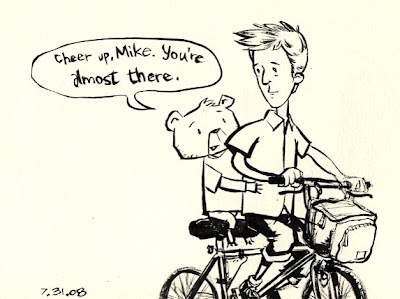 I often depict myself as this little bear, but ever since I put him in his own comic he's taken on his own traits, as though he's come alive. So I thought it'd be fun to put both of us on the same page. He's definitely based on my more optimistic side, as you can see here. As I mentioned before, things are busy. But not all of it is good busy. I need to keep telling myself -- even if it's through the voice of cartoon characters -- that I'm almost there. If I'm to remain optimistic, then perhaps I should be flattered that one of my pieces was stolen? I was taking down my art from a display yesterday when I realized it was gone. Thank goodness it was just a print.... nevermind the money, time, and energy it still cost me. But seriously, did this dude not read the part in the Thieves Handbook that artists are broke? My contact information is on the back of the frame. So hey guy: if you follow up on it, look me up online and stumble on this post, my message to you is to please pay up. Anonymously is fine. My other message for future reference: steal the artwork after we're dead. Mike, good to see you and Alex again last week. Even if it was just for a short time. I'm loving the adventures of Topo! My only complaint is that I can't comment on One Swoop Fell. Do I need to create a wordpress account to comment? Arkady, it was great to see you too. We'll definitely need to make it longer next time! You're totally right about the comment thing. I didn't realize people had to register on my website in order to comment, which is annoying. I changed it so that all you need is a name, email, and if applicable, a website. Sorry about that! By the way, just in case you'd still want an avatar to show up, go to gravatar.com. Once you upload your image there and assign it to the email address you use when you leave comments on blog, they'll appear no matter where you go.